Rensselaer County DA candidate Mary Pat Donnelly addresses the Schodack Democratic Caucus. Rensselaer County Democrats are hoping Mary Pat Donnelly can oust Rensselaer County District Attorney Joel Abelove in November. 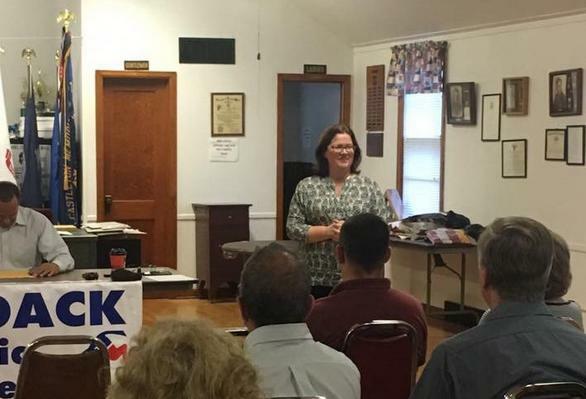 WAMC's Capital Region Bureau Chief Dave Lucas spoke with the former East Greenbush town justice about her candidacy. The Rensselaer County DA race is closely-watched. Mary Pat Donnelly says she's more than up for the challenge. "I've worked for 20 years in the Albany City Court, so I have worked in an urban environment, an urban criminal justice system in fact." Donnelly is highly of first-term DA Joel Abelove has managed the D.A. 's office. "There has been a lack of attention to cases, which has resulted in multiple dismissals on speedy trial grounds. I've seen a practical effect of these dismissals. And these aren't even some of the most high-profile cases. But I've seen the impact on the victims and the police officers. On the attorneys that come in and the way that the office is not tending to their cases on a calendar basis. Court is heard, people expect things to get done and things can't get done because the D.A. 's office in unprepared. More importantly, they've seen the dismissal of those important cases like the murder case that was recently dismissed for the third time just a few weeks ago." Donnelly says assistant district attorneys need to be properly trained and specialized and the office needs to be broken up into bureaus. Drawing a contrast with Abelove, she vows she will willingly comply with directives from the state attorney general and governor regarding investigations into police officer shootings of civilians. "There is no way under any circumstances that an elected official should be giving even the slightest appearance that they are protecting or assisting the officer after that occurs. The officer needs to be investigated and needs to have the answers brought from an uninvolved party. Rensselaer County is a small county. The DAs work hand-in-hand with the police officers on a daily basis. So for the elected DA of the county to insist on handling the investigation of a police officer who he works with on a frequent basis, it just doesn't allow for justice to be served." Donnelly says she expects a tough election season. "I have seen an escalation of —toughness might not be the word, I'll call it nastiness coming from the other camp towards myself. Personal attacks and repeated degradation of my abilities and I have been told to expect that to increase. So doesn't kill you makes you stronger I suppose and I'm in for the fight." Donnelly isn't too concerned about the countywide Republican voter registration edge. "I don't necccessarily think that everyone is going to be voting party lines this November. I think that having been going door-to-door for months now, I have met voters from all sides of the aisle who are really supportive of the idea of an independent candidate who is not going to be bound to either political party." Donnelly says she's heard quite a bit going door-to-door. "People are very upset. The Thevenin shooting is a big issue. The recent dismissal of the indictment of the individual from Mexico accused of murder is a very hot-button issue with many people. It comes right down to people don't feel safe." Donnelly says she is eager to serve and promises residents "an independent, professional and fair district attorney, who's going to defend justice regardless of anyone's political affiliation, social status, race religion or creed. I am there to do the job. The job takes with it a tremendous amount of power, but more importantly, a tremendous amount of responsibility and I am prepared to shoulder that responsibility for the benefit of everyone." Click here to listen to our earlier interview with Rensselaer County District Attorney Joel Abelove.